The Harp Guitar Kit is a set of attachments that retrofit on an acoustic guitar. 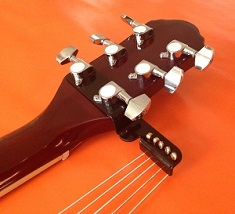 The attachments do not require any modifications to the guitar. They consist of a headstock bracket secured by the tuning machines, an array of tuning machines attached to the body with the strap button screw and a floating bridge(s). Email if you are interested in the Harp Kit. 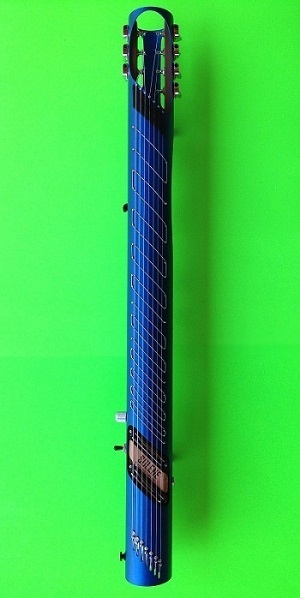 The Solene's tubular body with slanted, meandering frets positioned on the outer surface provides a new playing area for the two-handed tapping technique. Since it can be tuned like a seven stringed guitar, guitarists can visualize intervals in a familiar way. Email if you are interested in the Solene.